Premium quality laminating pouches for heat sealing laminating machines. Works is every brand heat laminating machine. Convenient size allows for minimal binding edge around all four sides. Gloss finish for professional results. 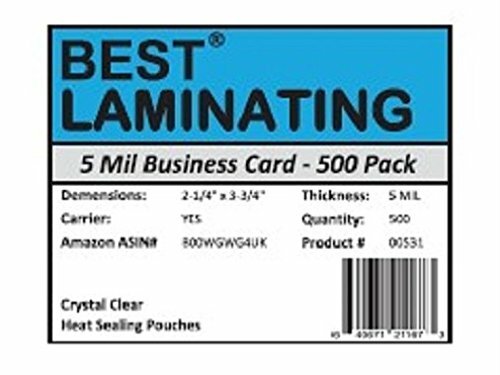 Trust Best Laminating® Brand Supplies For Your Heat Seal Laminating Machines. 5 Mil Heat Seal Laminating Pouches. If you have any questions about this product by Best Laminating®, contact us by completing and submitting the form below. If you are looking for a specif part number, please include it with your message.